New Zealand is a young country. A thousand years ago man was not here. It was a land of forests, mountains and beaches, untamed and untouched. At 22,530 hectares Able Tasman is New Zealand’s smallest national park and is renowned for its golden beaches, sculptured granite cliffs and world famous Abel Tasman Coast Track. 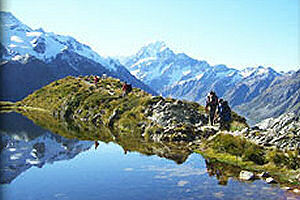 It also has a constant mild climate making it a great place to visit all year round. 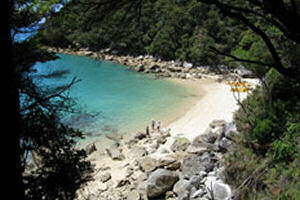 Activities available in and around the Able Tasman national park include tours, guided walks, caving, climbing, fishing, kayaking and coastal cruises. We are happy to discuss with you the myriad of options available and help you plan some memorable time in the area. We are also booking agents and can issue tickets for a number of companies so please do ask us for assistance….. Being New Zealand’s second largest national park, Kahurangi covers more than 570 kilometers, so you can expect longer walks but you will soon find that the park very much lives up to its name which literally means ‘treasured possession’ and you will be richly rewarded for your ‘tramping’ efforts enjoying the vast areas of untracked wilderness, wild rivers, rare wild life and spectacular views off high plateaux and fantastic coastal forests. Centred around the two magnificent lakes of Totoiti and Rotoroa and covering over 1,020 kilometers, Nelson Lakes National Park offers stunning views and scenery, from the rugged peaks of Saint Araud and Mount Robert to the amazing forested valleys of Travers, Sabine and D’Urville. This enchanting alpine national park is renown for its magical honeydew beech forests which feed a variety of tuneful, nectar-eating native birds and other wildlife. If you want to discover the natural soul of New Zealand, there are no better places to go than the spectacular National Parks. The National Parks are the real gems of this country. Preserving the natural heritage, the forests, the wildlife and the landscapes, close to – and in some cases, exactly – as it was before man was here.